The story of last year's (2013-2014) over-wintering hedgehog (which used to be on this page) is now here. Notes: Live video from the hedgehog enclosure (now offline, as the hedgehog was released). I don't guarantee that the video will remain online, or will be working at any given time. I have limited the number of people who can view at the same time, so try later if it doesn't work. I might reduce the image size or quality further if too much bandwidth is being used. There should be audio as well as video. You might need Flash Player installed in your browser, although the browser might be able to play the HTML5 video without it. Check that the timestamp displayed in the video corresponds to the actual GMT time, as it's sometimes possible to see video from when it was last working, even though the service currently isn't running. Offline at the moment, as the hedgehog was released. 2015-April-22 I've just turned off the live video, which was showing the lawn outside. A hedgehog, and sometimes 2 at the same time, visit every night. I still put out food. Of course I can't tell if the one I over-wintered is one of them. Just like last year, I saw one of the hedgehogs push the other into the pond (it quickly got out again!). 2015-March-20 It's gone! The camera looking at the hedgehog enclosure failed to motion-detect it leaving (it probably crept round the edge, where the infra-red light doesn't illuminate). Just before 8pm, there was an 'argument' between two hedgehogs in the garden outside - perhaps one of them the released one, but there have been two in the garden before, so that's not certain. Again one pushed the other into the pond, from which it soon got out. In the early hours of the morning, there were two video clips of a hedgehog looking into the shed door, but not actually entering, and the food in the enclosure was hardly touched. I think I'll switch the live video to the outside view for a while, before turning it off. 2015-March-19 The hedgehog weighed 612g today (increase of 68g in 5 days, average +14g per day). So it's increasing rapidly (and consuming large amounts of food to match). I've decided to give it the opportunity to leave tonight if it wants to (and indeed to return to its nestbox if it wants). There is more food available outside, and in the 'outdoor' hedgehog box, and there are other hedgehogs in the garden each night. I've changed the angle of the video camera so that the shed door is visible. 2015-March-14 Time for another weigh-in. The hedgehog weighed 544g today, so 38g less than when last weighed on 30th Dec 2014, which was about 2 weeks before it entered hibernation. So it's still not a large hedgehog, but is eating well - around 50g per day, about half of which is 'dry' stuff. I will consider releasing it soon - perhaps when some warmer nights are forecast, though the hedgehogs outside in the garden are active at night, so perhaps it's already warm enough. 2015-March-13 After the brief appearance 7 days ago, eating little or no food, the hedgehog didn't appear again until last night. It spent around 3 hours last night outside the 'nestbox' and consumed around 12g of assorted dry food. I've added some moist food for tonight. Moist food won't keep if not eaten, so it will end up put outside for the hedgehogs there if it doesn't get eaten. 2015-March-6 The 'indoor' hedgehog (in the shed) made its first appearance after around 2 months hibernation in the evening. Perhaps by coincidence, I'd decided to check it earlier in the day - definitely alive - skin and spines responding to being touched. I aimed my infra-red thermometer at it, and got a reading of 22C - much higher than ambient, and I would think meaning that it wasn't far from 'awake' state. I'm seeing hedgehogs outside in the garden every night now - 2 at the same time a few nights ago, when one of them pushed the other into the pond (it soon got out again). 2015-January-26 The 'indoor' hedgehog was last seen active on 12th Jan 2015, so is now hibernating. Surprisingly, I'm still seeing an 'outdoor' hedgehog every few nights on the garden video - temperatures have hardly been below freezing. 2015-January-9 I moved the enclosure out of the house to the unheated shed 3 days ago. The hedgehog has had a number periods of inactivity of a day or two, but then emerges again for part of the night, and eats a bit of food. 2015-January-4 The hedgehog disappeared into its box on the evening of 31st Dec 2014, and then wasn't seen for 3 days. But last night, it emerged briefly in the early part of the evening, and ate a bit of food. 2014-December-30 Weight 582g today (increase of 8g in 7 days, average +1g per day). Recently the hedgehog has only been active for the first part of the night. I turned off the heat mat, as the weight is now fairly satisfactory for hibernation (and isn't increasing much). 2014-December-23 Weight 574g today (increase of 18g in 6 days, average +3g per day). 2014-December-17 Weight 556g today (increase of 46g in 12 days, average +4g per day). The weight gain seems to be tailing off a bit, but is quite similar to the rate of increase in the hedgehog I took in last winter. 2014-December-8 After only two days, I've gone back on my decision to only feed the moistened cat-crunchies (with 'extras') - I didn't feel that the hedgehog was eating enough of them. Last night, I mixed in moist food as well (it's cat-food this time, not that the analysis is much different to dog-food), and all 80g of the mixture was eaten. 2014-December-5 Weight 510g today (increase of 38g in 6 days, average +6g per day). As the current supply of moist dog-food has run out, I'm going to try just the moistened cat crunchies, plus the usual 'extras' as below. Dry food is so much more convenient, rather than dividing a tin of dog-food into portions, and freezing them. 2014-November-29 Weight 472g today (increase of 88g in 6 days, average +15g per day). I thought, from food-consumption in the last few days, that I was going to see a good weight gain at today's 'weigh-in'. Perhaps due to the cat crunchies now being moistened? Typical daily food is something like: 24g cat crunchies, moistened with 16g water; 22g 'wet' dog-food; 10g sunflower hearts; 4g sultanas; 2g dried mealworms. Occasionally a drop or two of 'Abidec' vitamins. 2014-November-23 Weight 384g today (increase of 30g in 6 days, average +5g per day). Not such a rapid increase. I wondered whether the dry cat crunchies were too hard to eat, as many were being left, while the moist food was being eaten. I decided to start moistening the 'crunchies'. 2014-November-17 Weight 354g today (increase of 74g in 6 days, average +12g per day). I've sexed it as a male: there's a good photo here - mine is very much like the right-hand 'male' picture. A bit confused earlier, as I'd read elsewhere that both sexes have a 'belly-button' - well I'm sure they do, but I couldn't actually see it. Last night, I put out 78g of mixed wet/dry food, of which it ate 56g - as ever, the weight eaten depends a lot on what the food is, as there's 4 times the protein and 2 times the fat (by weight) in the 'cat crunchies' as in the 'wet dog-food'. It's so useful having the video camera, and the motion-detected recordings from it. 2014-November-12 54g of mixed 'wet' and 'dry' food eaten last night. I decided to put the video online again. 2014-November-11 The hedgehog seems to be doing well, and today weighed 280g (increase of 28g in 3 days, average +9g per day). It's eating a mixure of moist and dry cat-food, plus sunflower hearts, crushed peanuts, sultanas, and dried mealworms. As I learned last winter, the amount of food consumed each night varies a lot depending on whether it's 'wet' or 'dry' food (the former is mainly water, so more is eaten). 20-40g of dry food seems typical. I removed two ticks from it today (which had been attached from the start). 2014-November-8 Weight 252g today - it appears to be eating and drinking healthily. 2014-November-7 I'd seen a small hedgehog visiting the garden on the outside video camera, and weighed it 3 days ago - 232g. I weighed it again this evening - 236g - and decided to take it in for over-wintering. I had seen it at the same time as an adult hedgehog a few times - perhaps its mother, but a youngster of this size would be becoming independent. General opinion is that a hedgehog should be 600g or so to survive hibernation, so it probably wouldn't put on enough weight to survive outside. 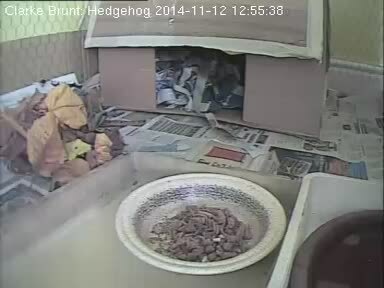 It's in an enclosure in a cold part of the house, with a heat-mat underneath a cardboard 'nest-box'.